Thank you for visiting Herbs and Oils Hub!! 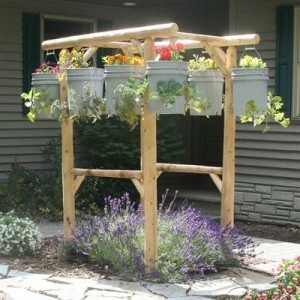 There are a lot of interesting ideas out there for container and vertical herb gardening. These methods are gaining in popularity as people with smaller yards try to include herbs into their garden plans. In this article Greenthumb has some different and creative examples of vertical herb gardening solutions. I have relatives who use the terraced or hanging garden solution. They have a lot of space but like the look of the vertical herb garden solutions. Click the DIY Potted Herb Garden Ideas link below and check out some of the great vertical gardening solutions. We hope you enjoyed this post. Herbs and Oils Hub shares the best information we can find in the world of natural health remedies, beauty remedies, cleaning recipes and more. If you have any questions, please contact us at Herbsandoilshub@gmail.com. Thank you! Disclaimer: Information offered on the Herbs and Oils Hub(“HerbsandOilsHub.com”) website is for educational purposes only. The information on HerbsandOilsHub.com has not been evaluated by the FDA. HerbsandOilsHub.com makes neither medical claim, nor intends to prevent, diagnose, treat, or cure medical conditions. All people should consult their licensed health care provider, before taking any herbal product. In particular, women who are pregnant or nursing, and persons with known medical conditions, should consult their licensed health care provider before taking any herbal product. Links to external sites are for informational purposes only. HerbsandOilsHub.com neither endorses them nor is in any way responsible for their content. Readers must do their own research concerning the safety and usage of any herbs or supplements.